Okay, now this does go from two strands to one. I used a single crimp cover on each side and used some slightly larger beads to cover the rest of the crimps. I slept on it last night...I don't like "two strands of softflex" design at all. I was wrong about both strands having to fail. If one strand fails, it'll come out on one side. Plus the finish of it is awkward, and, I suspect, weak, since each strand has to bend at the top to make room for the other strand. I'm going to try design #1 today, where you crimp the two strands at the top of the 2-to-1 beads. Ugh, this photo sux. I'm too tired to try getting a pic that's not out of focus? Here the bugger was deciding how to handle the 2-to-1 strand design. The other time I did this type of design, I crimped the double strands on top of the cones--here I'm using 2-to-1 beads rather than cones--which was necessary in the previous design because some of the beads I was using for the single strand part had small drill holes. Here it's not at all necessary so I decided to make the "one strand" part double, in short I brought both lengths of softflex up all the way to the back. Since I'm using wire thimbles, it was a bugger getting the ends closed. Now my greater question is whether or not this is a stronger or weaker design than the first. My gut tells me it's actually stronger, since both strands would have to fail in order for the piece to break. Plus, it does look nicer in front because I don't have to design around a set of crimp covers. Ugh, waiting on those beads to arrive is driving me nuts. I was wrapping some wire links in the semi-darkness the other night...I feel very comfortable now, doing these. The ones I did in semi-darkness, came out better than the ones I did before in full natural daylight. It takes more than a year to get these the way you want them to be (at least for me, ymmv), but once you do, it's like riding a bicycle. I changed up the square pearl bracelet, adding some links with my (slightly webby, definitely not AA) Sleeping Beauty turquoise nuggets. It's better; when I'd done it originally, it was before I got the Swiss Blue topaz clasp, and blue turquoise goes well with that lovely, almost sky-blue stone. There are a few pieces I could repair, but I'm so not in the mood. I'm waiting on a bead order...ugh. Supposed to get here next week. A couple of the rosary loops are starting to pull agart. It's not at the point that the thing has broken, but I don't like that. I can use the same idea for a necklace...rosary loops and tiny spacer beads...I'll guess it wouldn't pull apart there. But bracelets seem to require a much sturdier construction. So, I'm thinking of how it would look with wrapped loops. Going to try retooling this, and repairing a few other odd pieces, until the bead order arrives (it's crucial, mostly spacer beads). 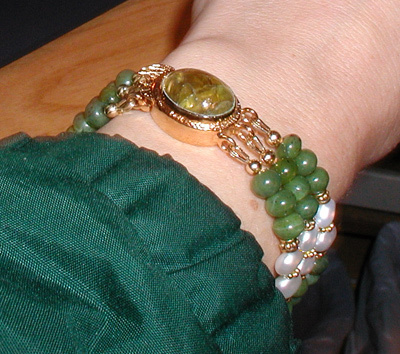 Mmmmm...I've decided the peridot bracelet isn't quite "it." It's nice and I like the components, it's just not "it." I've been thinking lately, it takes me about four months or longer to create a single piece. Not the fabrication part of course...the materials. The stuff I've made recently, has been made largely from beads I bought four months ago. Whenever you see a piece of handmade jewelry you like, if you look it at closely, it usually contains a variety of beads...not just one or two kinds. It usually contains several components also. That's what's time-consuming...finding the stuff. One of my recurring fantasies is of owning a bead shop. It's like, I just go to the shop and pick out everything I want to make the piece. I think that's another reason it takes about two or three years to get things the way you want them. Before, I thought the sole reason was that you had to develop your skills...and possibly figure out where to buy stuff, how to find the best prices and materials. But part of it definitely is the "collecting" aspect...accruing enough of "this and that" to create more complex designs. Okey dokey...the Hypo Cement alone was not enough to anchor the end caps (see previous posts). Not that it should have been; it was sold as a "glue-in and crimp" clasp. 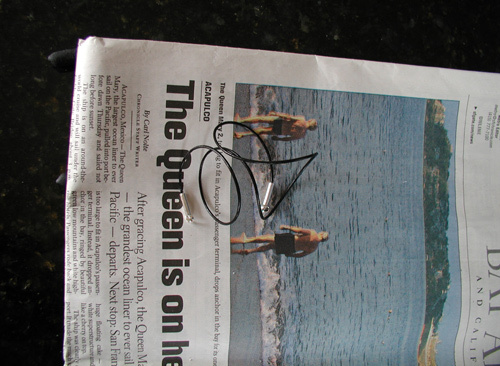 I was just seeing if it would work with glue alone. Part of it could have been that I didn't get enough glue in there (Hypo Cement tends to come out even when you don't squeeze the tube), part of it could have been that it didn't cure long enough (the end cap is completely closed on one end after all). I gave it the full 24 hours and then tried pulling it. One end felt loose, the other less so. I started crimping the bottom of the loose-feeling cap and gave it a pull. The entire cord came out. :p I pushed the cord back in and this time really crimped it...and tried pulling it. Basically I pulled it up to the point that the leather started to stretch...I expect the clasp to be secure. Crimping it did work. Anyhow it's done, except that I'll attach an extender chain when I get some. 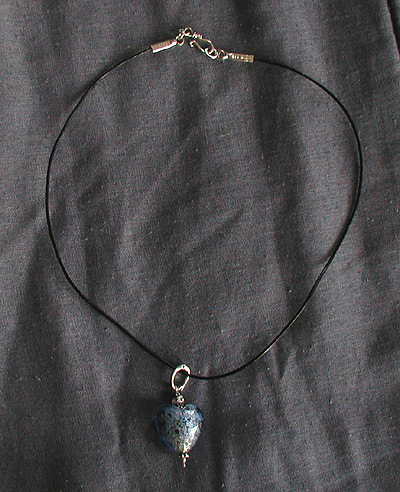 I'm planning to make a series of these actually, using different Italian glass heart beads. This is a blue bead my daughter discovered in a bead shop, combined with Bali sterling spacer beads and a Swarovski roundelle. This is going to go on the leather cord necklace when the latter is done. Heh heh! At first I added the usual two inches to the softflex...that's what I've been doing for bracelets. When I started stringing this though, I realized I would need three inches, not two--the wire thimble and two crimps on either end, take up enough additional space to warrant it. 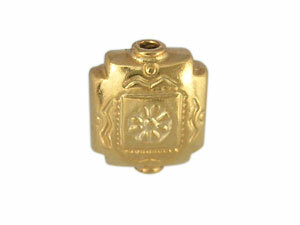 These are Artbeads.com goldfilled crimp covers. They are the right size, but the opening is smaller than Fire Mountain Gems' equivalent covers. I ended up jacking open the covers with my pliers to get them on. Once they're on, they're easier to close than FMG's, and they close very neatly. But there is that extra hassle in having to open them further before attaching them. I tried to squeeze 'em full of Hypo Cement. As usual, it's messy. I'll need to let them dry for 24 hours before knowing whether or not glue alone will anchor the end caps. If it doesn't the first time, I'm going to try injecting the caps with more Hypo Cement. I started making one of these today and got sidetracked. Anyhow...I have some round 1mm black leather cord. It's surprisingly nice and flexible, not stiff and funny like some premade leather cord necklaces. I got it at Fire Mountain Gems. Now I've never made a "cord" anything before. I was placing an order at Rings 'n' Things and added a clasp made specifically for 1mm cord. It's Indian sterling silver, basically two end caps (glue-in and then crimp) with an S-clasp on it. I cut a length of the cord today and was going to glue the ends in with Hypo-Cement (as I say, I got sidetracked). I did notice that the end caps were pretty roomy for being made specifically for 1mm cord. I'm envisioning using a lot of Hypo-Cement in there. Wondering now if it will be necessary to crimp the ends after gluing them. Seems a shame to crimp if it's not necessary...wouldn't that make the ends kind of flattened and yucky? If the Hypo-Cement flies alone, I won't bother crimping. It's a nice enough clasp and didn't cost much, but now I can see there's little point in buying a "cord clasp" when you could just as easily buy just the end caps. Once you have the end caps on, you can attach any clasp you like. As I say I am clueless regarding cord necklaces; I was happy just to find end caps that fit the durn cord. I'll report back how the Hypo-Cement works out. 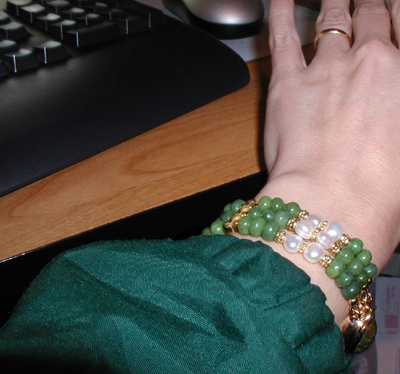 Lessee, I finished both the jade and pearl bracelet and the necklace. I'll have a pic soon, I tried taking a few pics today and they were all out of focus and I didn't have time to take more. Those Artbeads.com crimps are so good it's scary. The base metal ones I used before, you had to press pretty hard to get them firmly closed. But these, you press only lightly and they're tight as a drum. You have to keep that in mind. I started pressing one today (I double crimped the necklace) and then tried to move it down a bit...couldn't really do it. Once you start pressing, it's fixed. 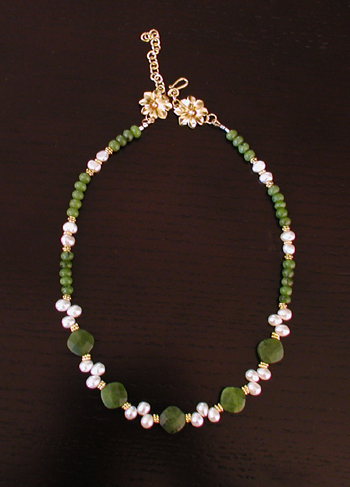 I think one reason I find it difficult to make jewelry has to do with me never really owning jewelry. i.e., my idea of buying jewelry tended to be based on what I could afford at the time...not on what I actually wanted to wear. Now, the cost of the components is not the same factor. If you added up the cost of materials, even given that I don't get bulk discounts and don't have a resellers license, there is no comparison. You can buy a nice vermeil clasp with a small (not tiny) ruby or sapphire in it for less than thirty dollars. If you wanted to make 18K gold jewelry, you could do that too (of course the cost would be steeper, again no comparison to buying readymade 18K jewelry). Now, if I had a strong sense of what I wanted all along, it would be more a matter of copying just that. Oh well, everyone has to start somewhere. I'm finding one of the "arts" of doing this sort of thing, is managing the costs of the materials. Even since I've been doing it (last half of 2005), the materials have changed. Crimp covers were brand new back then (if you can find online pics of strung jewelry made before then, they don't have them). There was this pliers gizmo that was supposed to "make crimps look like beads," that worked only for certain kinds/sizes of crimps, then the covers came out. Now it's all about wire thimbles/guardians, using better crimps...I finally used up the last of my base metal crimps and now I'm using sterling ones. mumbles... Yes, there is a difference. With the base metal ones, you have to squeeze them pretty hard, which is not the best thing for metal crimp or beading wire. The sterling ones are thicker, you bend them more slowly but not nearly as hard. The jewelry making supply industry is its own industry...you really do have to shop around. The markup varies wildly, for the exact same items. There is a terrific range of quality too. 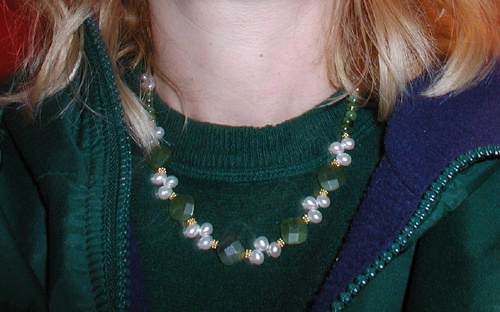 I actually found another jade rondelle, under a bunch of other stuff...meaning I have exactly the right number of rondelles to do the necklace (previous post) and three-strand bracelet (couple of posts ago).